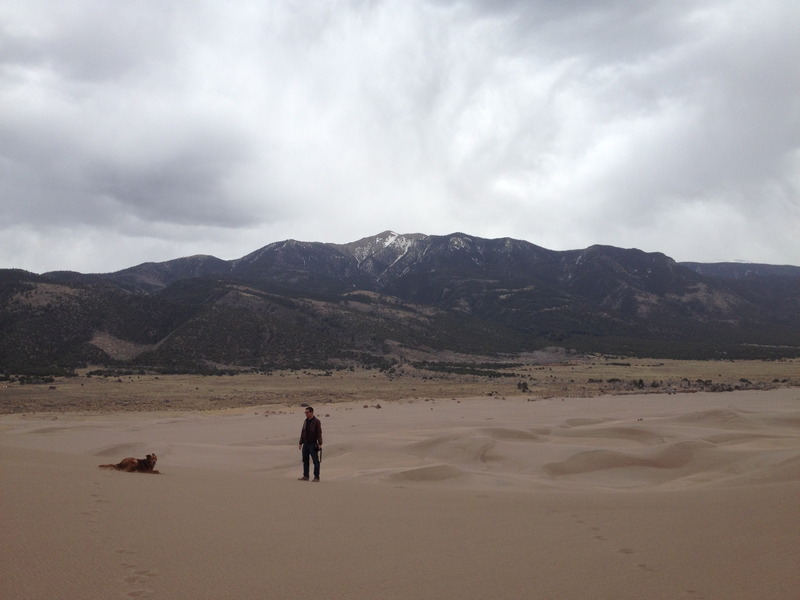 After nearly a month in the desert, we were really, really looking forward to Colorado. To have a day where red dust doesn't blow through our open trailer windows and coat everything in a fine layer of grit. To see some real trees, not just water-starved shrubs. To have rainy days! There's nothing wrong with the desert, we were just antsy for a change of scenery. Well we got to Colorado. It rained a few times, which was awesome. The air was crisp and chilly at night. And there were mountains. Big, snow-topped mountains. We stayed in this tiny little po-dunk town in southern Colorado that was completely forgettable…except it was snuggled up against the most Colorado-y looking 14,000 foot mountain. We woke up in the shadow of Blanca Peak, the fourth highest peak in the Rockies, every morning. 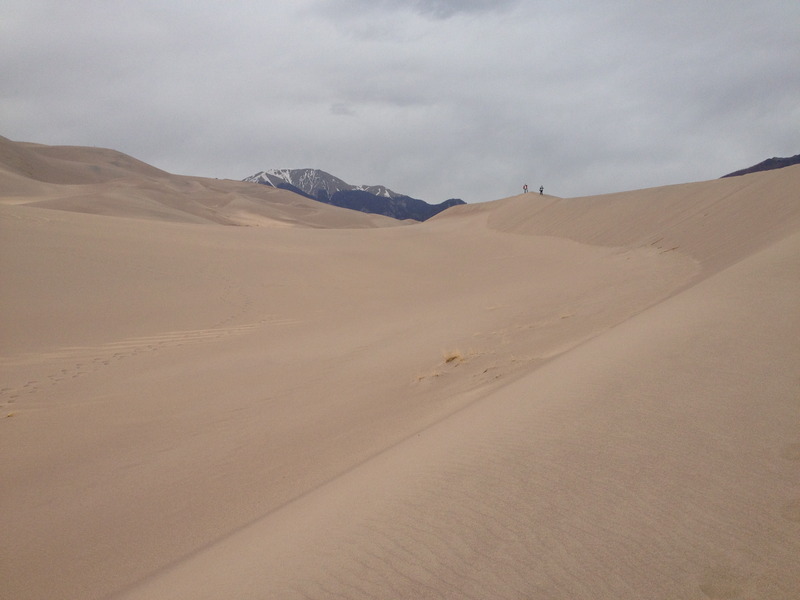 Our plan was to go to Great Sand Dunes National Park. I think it may be the least heard-of national park in the country. No one knew what we were talking about. But we had gotten our first taste of dunes a few weeks before at White Sands and wanted to see if the Great Sand Dunes live up to their name. The campground host suggested we stop by Zapata Falls on our way to the Dunes; he described it as "a hidden gem" only four miles off the main road. Who are we to say no to a waterfall? What we didn't know was those four miles were bumpy, washboard dirt roads that switchbacked 1,500 feet upwards. We finally made it and hiked half a mile to the waterfall, which was still half-frozen. 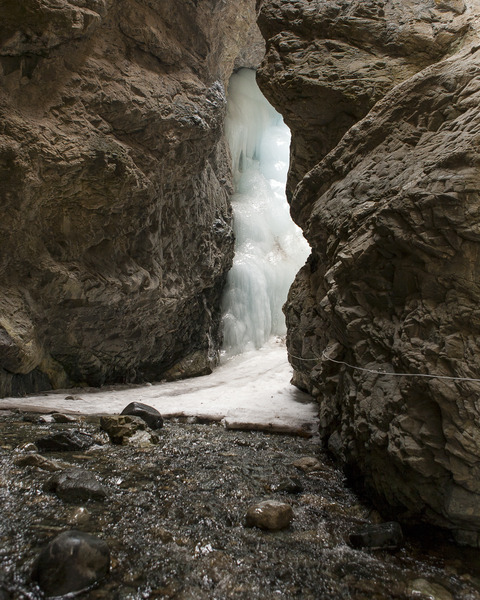 With the surface of the water still frozen solid, we stepped carefully on the frozen icy river towards the curve in the rock that exposed Zapata Falls, a icy, cloudy blue popsicle, frozen in time. 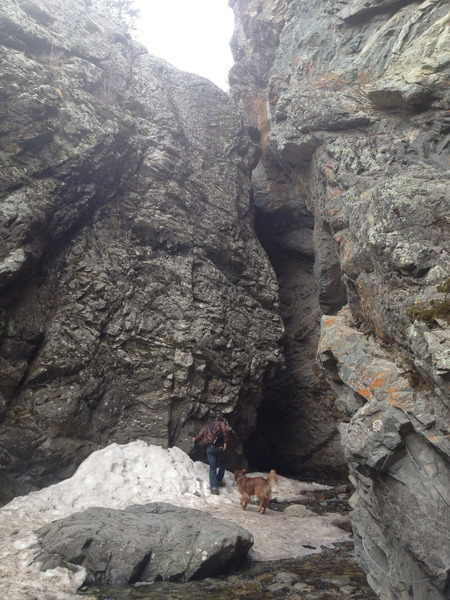 Bulleit could have cared less what he was walking on, he excitedly bound back and forth from icy patch to icy patch. 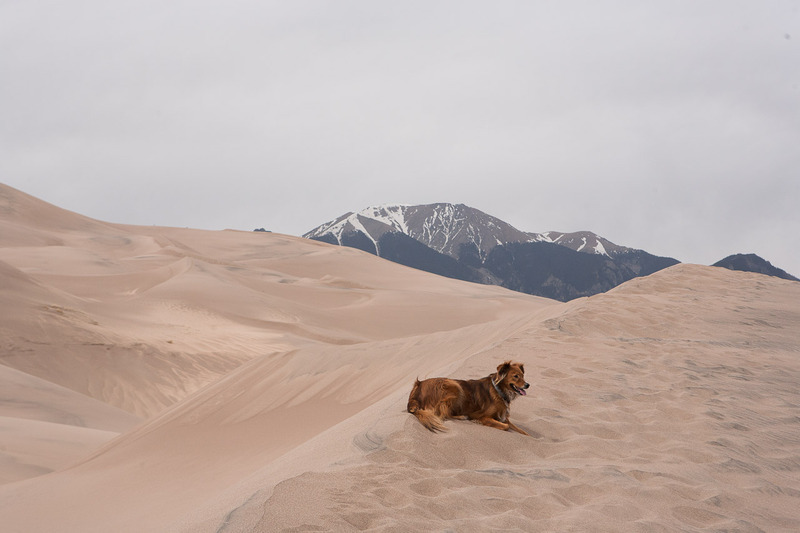 Satisfied with our waterfall experience, we bumbled back down the dirt road and continued towards the Great Sand Dunes. 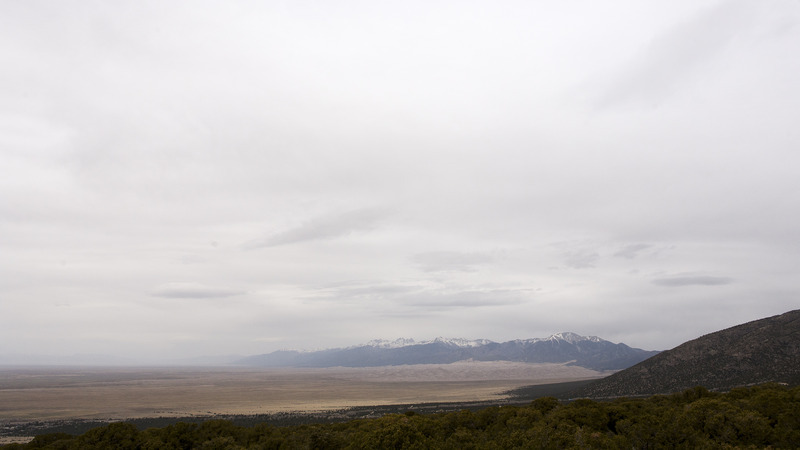 From the road, high above the San Luis Valley, we could see the Dunes below; sandy waves pushed up against the western slopes of the Sangre de Cristo Mountain Range. 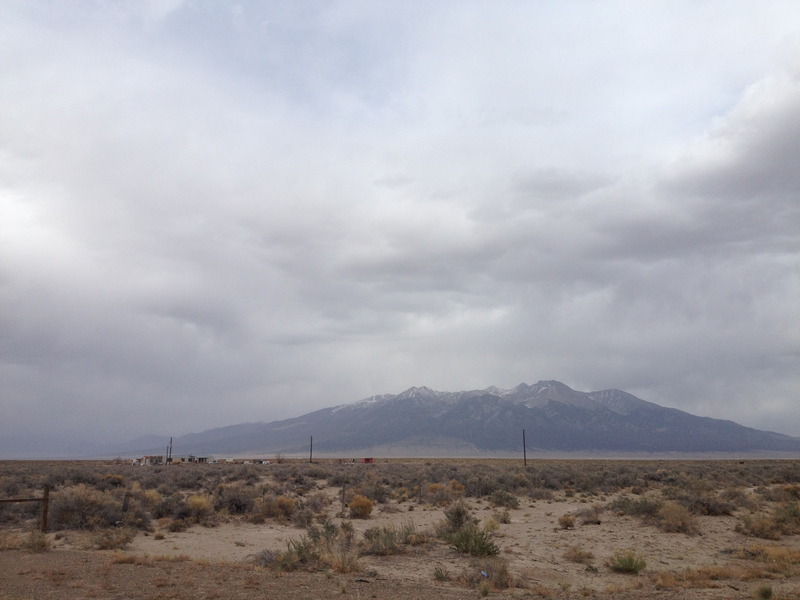 As we neared, the dunes rose up higher and higher, until we could barely see the massive mountains behind them. From the parking lot, it's a flat fifteen minute walk just to get to the base of the dunes. The High Dune rises 650 feet, spanning as far as you can see in both directions but it was nearly impossible to get a sense of distance because of the monotonous color of the landscape. The overcast skies that were threatening more rain didn't help much either. All we could see was tiny ant people at various points on the dunes. We wanted to hike to the top but made the mistake of climbing the dunes at an angle, heading towards the mountains instead of climbing straight up to the top. Hiking in sand is a million times more exhausting than hiking on solid ground; after nearly two hours we felt like we barely made any progress and the sandy summit seemed as thought it was getting further and further away. The higher we climbed the windier it became, blasting our tired bodies with tiny bullets of sand. The clouds darkened and it started to sprinkle. Miserable, exhausted and covered with sand, we lamentably turned back. 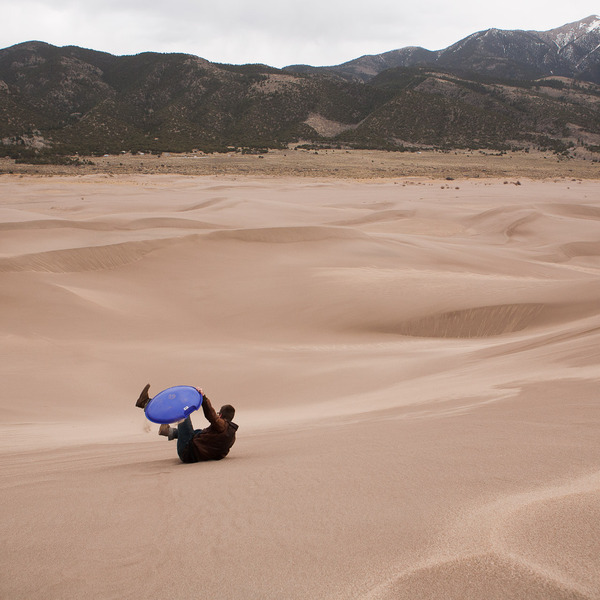 Failing to make it to the top of the Great Sand Dunes is still the one thing on this trip that we regret the most. We were simply not prepared for the intensity that comes with sand-hiking. 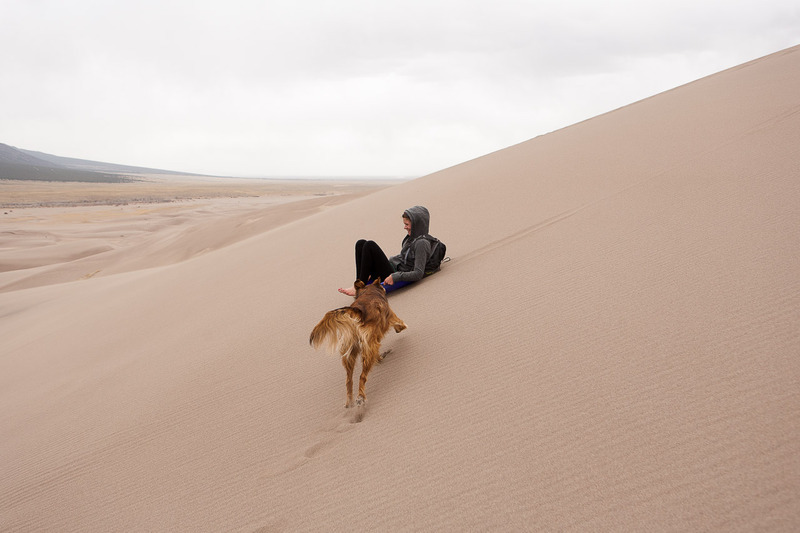 It was still awesome to experience the tallest dunes in North America; they truly live up to their name. And one day, we will climb to the top. Walking back to the truck. Tired, cold, sandy and defeated. Special thanks to laura n. (who suggested get sand in yer pants) for making this blog post possible!